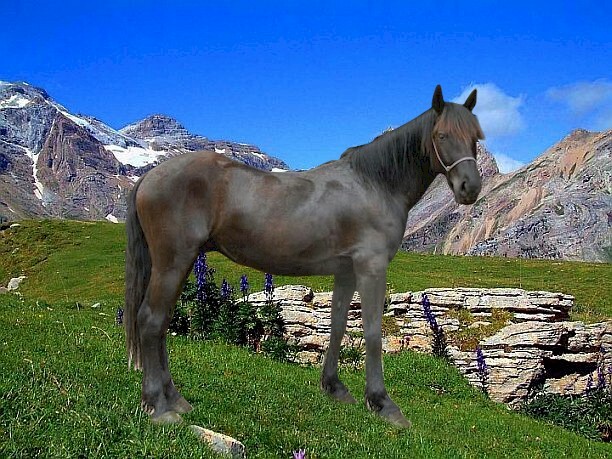 Ariègeois Ponies, also known as Merens ponies, are a pure-black rare mountain pony native to the Pyrenees and Ariègeois mountains of Northern Spain and Southern France. Thought to be of prehistoric ancestory, these ponies were originally domesticated for use in mines and hauling timber. These handy ponies were also indispensable to the mountain farmers of the area and valued as hardy war mounts. They are robust, kind, and easy to care for. Physically they are very similar to Dales ponies or Friesian horses. It is believed that during the Muslim invasion local stock was also enhanced by Arabian blood. Ariègeois breeders generally raised their animals by allowing them to graze freely in herds. Foals are born in the spring and in June the herd is taken to the high mountains to pasture. It is thought that this lifestyle lends to their strength and character. Perhaps due to their rather extreme geographical isolation, the Ariègeois animals tend to be similar physically. They are black, seldom even with white markings. Through dilution of the bloodlines over the years, pure-bred specimens are rare and may only be found in the high valleys near Andorra. However their signature black coat continues to bear their mark in the cross-breeds. Luckily their popularity is increasing, both inside of France and throughout Europe. On average they are 13 – 14.3 hands high. They have a strong constitution and able to thrive in poor conditions. They are well built to handle severe weather and are surefooted on mountainous terrain. They have a small, refined head; short, strong neck; a long back and rounded hindquarters; and a thick mane and tail. Traditionally they are pure black, sometimes they have white marking but that is unusual.